Editor’s Note: Thank goodness for this rather detailed report from Starship Earth about the truly weird weather and visits from our positive ET cousins. The truth is stranger than fiction, my friends,and it seems to me that this will be the last (one of the last? )hurrah for the cabal. We never know what we’re going to wake up to each day any more. Giraffes in the snow in South Africa, for Pete’s sake? Since when are giraffes and caribou interchangable? Not only do we have increasingly violent “Earth changes” to deal with, we have the powers-that-were adding their spin to things; exacerbating storms, earthquakes and other potentially dangerous events in, on, and around our planet. From Jamie at ‘A Plane Truth’ we have a video that goes into the “craft” in our skies contributing to the chaos, hiding in the clouds, MAKING clouds and seeding clouds. In other words, manipulating the weather. Perhaps this will clarify the video below that Ben Fulford pointed us to in his September 3 update. Benjamin Fulford included this next video in his update and it doesn’t leave anything to the imagination. Be sure to wait for the zoom. Having seen this, is it any surprise that the President and his cabinet are announcing the formation of a “space fleet”? Clearly, the technology the military have is FAR beyond anything they have let on—courtesy of American tax payers. We have ourselves to thank. Does it look like gravity is a problem for these massive craft above, or the ones flying in and out of them? Thousands of us now know the “secret” space program is decades old and no secret. And there’s more than one. The President is just breaking it gently. We’ve heard the tech the world’s military is using in their “secret” space programs is anywhere from 50 to 100 years advanced over what they show us—so it’s probably more. We learned of the TR3B Astra 5 years ago or more, and while some may pass it off as the latest “secret military aircraft”, it is anything but. You can bet that if we’re seeing and hearing about the TR3B and the patent is now in the public domain, that they have craft light years beyond this now. Humanity only gets military cast-offs when they have something better to wear. It’s important to note, however, that many folks have seen and photographed triangular craft in the skies over our cities in regular neighbourhoods. They hover in the dark… silently and stealthily. What are they doing? Surveillance? Watching? Listening? Are they friend or foe? Everything that happens on this planet they don’t want to tell us about is due to “national security”. We’ve had enough of the coverups. President Trump is all about transparency and getting us up to speed, however, so the lies won’t be clouding the truth much longer. I took the following photo in the Phoenix, AZ area on July 29, 2018 at 6:15 pm. Have you ever seen such fake clouds? The sky was covered with them and they developed quickly. More nights than not, chemtrails would rapidly cover the western sky in cloud and we wouldn’t see the sun set. With their machinery manufacturing clouds, is it any wonder it does nothing but rain in the Eastern US, and the drought continues in the West? Does anyone think that’s an accident? “Climate change” is a myth; a cover-up for the treasonous efforts to engineer the weather. We’ve seen video footage from ‘1PacificRedwood’ channel showing us how they pulse low pressure systems off the coast of California with heat to break them up so they don’t bring rain. California being a major food-producing region of the United States means that long term that is problematic. Rain would make California less favourable for the future plan of purposeful “wildfires” in the parched forests of Northern California ignited via lasers-DEWs and man-made lightning. Chemtrails, we’re told, are sprayed partially to render the atmosphere conducive to that kind of technology creating a powerful “incendiary device” to torch millions of acres of land. There are no accidents. Many countries signed a Treaty in the late ’70s pledging not to use “weather weapons” on their allies. No worries. The United States rogue military under the New World Order uses weather weapons on their own citizenry. There’s no crime in that, is there? The inconvenient truth is, if you can control the planet’s weather, you can control the agriculture. You can create feast or famine, and if there’s a way to destroy a civilization—it’s through starvation. We won’t even get into the social evils that erupt from lack and desperation. When a “freak snow storm” or freezing temperatures hit a nation that don’t normally see that, it can decimate crops—as can hurricanes, floods, landslides, hail storms, tornadoes and wildfires. Fortunately, Donald. J. Trump signed into being an Executive Order or two that will mean people committing treason, sedition, and Human Rights Violations will be punished to the extreme letter of the law. Unfortunately, it’s not only the people who are suffering. We’ve seen countless videos of our wildlife wandering around dazed and confused—sometimes lashing out at Humans in their painfully disoriented state due to the manipulation of our reality. We’ve heard all sorts of convincing rationalization as to why, such as “they’re dehydrated”, or “it’s isolated rabies”. I’m not buying it. They experiment on the life on this planet all the time. Why do we think entire pods of whales and dolphins beach themselves? Why are there whales and dolphins bleeding from their “ears”? Why do entire flocks of birds fall en masse from the sky? Why are there gigantic fish die-offs washing up on beaches? Something is desperately wrong with our world, folks. It’s UN-real. What is reality? Does anyone know any more? If you’re not familiar with the Boogey Man channel, Andrew may have some surprises for you. Some ‘un-real’ surprises. What The Hell-NO Is Going On In Our Skies Today ?!? 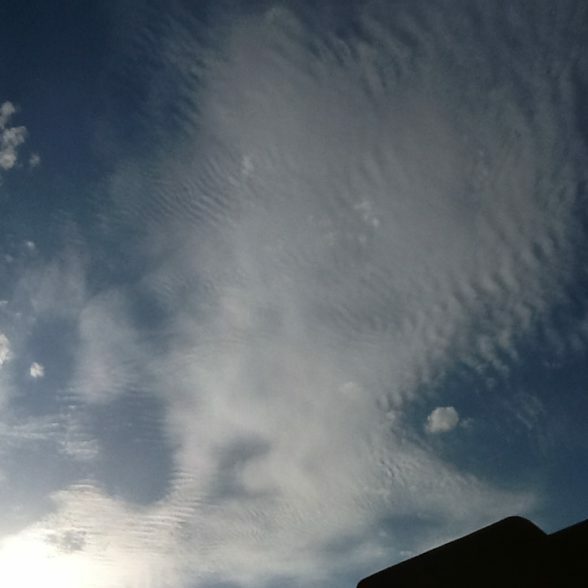 Sean Gautreaux has discovered the trick to exposing the cloaked craft in our skies. It’s mindblowing what a little tinkering with the camera will do. WHO/WHAT Is In Our Skies, War in the Heavens, Water Elementals, Angels, Demons, Triangle Craft? The star footage I’ve seen on the Internet fascinates me because when I look to the sky at night, with the naked eye I see “stars” that are flashing red, green and blue lights—exactly like one of the stars in this video below. Stars didn’t always look this way. At 3:45 in the video below we see a star called “Denab” and it looks exactly like the ones I see that have me transfixed. My binoculars aren’t powerful so I don’t get this good a look, and it’s wonderful to see this close up. What the hell is that? THAT is a star? I have to agree that the images certainly resemble the patterns I see on the bottom of my pool when the sun filters through the ripples. Are people who speak of the “water” beyond the firmament disinfo artists? Are they really conspiracy theorists and whack-jobs? IS THE EARTH FLAT? Why do rockets always arc instead of going straight up? Why do researchers’ small experimental rockets with cameras attached suddenly stop on a dime when they reach 73 miles altitude? Are those all hoaxes? Maybe the Earth isn’t flat or maybe it is, and maybe it has a dome over it—even an “atmospheric one”, but where the hell ARE we? We are not in a real world. Call me crazy, but I always assumed stars were solid spheres like the moon, the sun, earth. And now the moon doesn’t look solid, either. So what is going on? Do people ever wonder why the sun and the moon—vastly different in volume, according to scientists—look the same size to us? Clearly, we don’t live where they’ve led us to believe we do. And if they would keep all this a secret, why believe them about anything? Our entire education from our exit from the womb to this moment has been a lie? I think there’s a very good reason NASA is known as, “Never A Straight Answer”. This is another good video exploring the concepts above, and at the 10:55 mark we can see clouds drifting BEHIND the moon. So, what’s the deal, folks? Why does what thousands of people are seeing around and above us not match the narrative? What are all these gadgets and craft doing in our skies? Why doesn’t anyone but the alternative media speak of them? Who put them there? Who is operating them? Why aren’t we told? A rational person could only come to the conclusion that they must be hiding something. Why? And who is “they”? We knew about the sun simulator months ago, and there’s a very old patent, but no one in a position of authority or the media ever mentions it, so they’re hiding something, and I don’t like it. I am sick of the lies and coverups. I’m fed up with being manipulated and managed. Aren’t you? I don’t know what’s going on, but it appears there is a firewall between us and the real sky—or something. We’ve seen video of clouds floating behind the moon. That is only possible if a) the moon is not as far away as I was taught in school or b) we’re not seeing the real sky, and it’s a projection or some other construct. What are those shadows cast by clouds reflecting off of? A shadow has to be cast ONTO something. What is there above the clouds to cast a shadow on to???? Is the fakery related to Earth being under quarantine? Is that it? Because if that backdrop to the heavens people are documenting is a visual to appease the masses because the cabal has been purposely trapped and contained here by the Light Forces so they have to face the music and can’t further contaminate the civilizations who have already purged them, then I can live with that. I just want someone in a place of respected authority to come out and say it. Then I might believe it. MIGHT. And don’t bring me Neil deGrasse Tyson! I certainly hope President Trump, President Putin and whoever else is relegated with the task, will respect us enough to come clean about the snow job past administrations have done on We, the People, and take us through the 21st century in an honest, honourable way. Knowing and seeing the above documentation, we are hard pressed to accept that anything in our world is real any more. We are sovereign Humans and we deserve the truth. People can accept it, or leave. Anyone who doesn’t want to live in the real world can look for a better one. Because I hate being lied to I am so appreciative of the folks who bring us the spectacular footage of what they are discovering in our reality that the ones running the world continue to bury and censor. This entry was posted in Uncategorized and tagged A Plane Truth, aircraft carrier, Boogey Man, cabal, chemtrails, cloud makers, cloud seeding, coverups, DARPA, DEWs, directed energy weapons, distance from earth, drones, drought, Earth, energy, fake, firmament, floods, geoengineering, hurricanes, lasers, lies, love, moon, NEXRAD, portable, projections, quarantine, radar, reality, Sean Gautreaux, Secret space program, shadows, snow, stars, Starship Earth, Sun, sun simulator, technology, TR3B Astra., weird weather. Bookmark the permalink.